[float=left] [/float] Below is a press release from the Economic and Financial Crimes Commission, EFCC The Economic and Financial Crimes Commission has arrested one Kingsley Mudi over alleged ATM fraud. He was picked up at about 11 pm on August 2, 2013 at Fidelity Bank ATM on Airport Road, Warri, Delta State following an intelligence report. 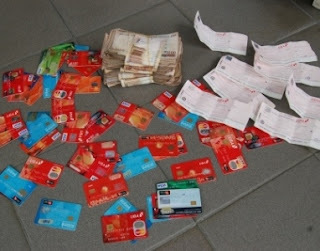 At the point of arrest, 30 ATM cards of different banks with which he allegedly withdrew a total sum of five hundred and fifty thousand naira (N550, 000) were found in his possession. 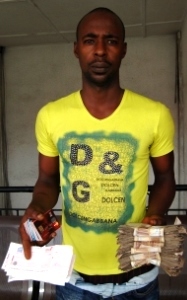 Eight signed UBA cheques belonging to sundry persons were also found on him. Kingsley Mudi, who claimed to be a Disc Jockey and an operator of a barbing salon, has volunteered useful information. He will be charged to court as soon as investigation is concluded. Wilson Uwujaren, Ag. Head, Media & Publicity, 5th August, 2013.